A Copiosis enthusiast asked the following question on the Copiosis Social Page on Facebook. It offers opportunity to better understand the innovation. So I’ve pasted my response here, with slight modifications for clarity, and broken into parts for quick consumption. Question: How does Copiosis deal with differences in individual ideological/belief systems? How are divergent beliefs incorporated when determining Positive and Negative Net-Benefit? 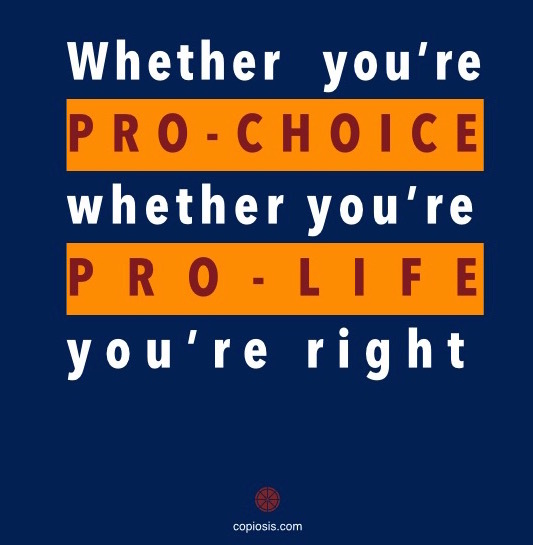 For example, a doctor (producer) provides a woman (consumer) with an abortion procedure. There would be vastly different opinions of whether or not this service was a Positive or Negative Net-Benefit. How would such situations be resolved? The case of an abortion procedure illuminates many aspects of Copiosis. It also allows us to explore and contrast our society today against a future Copiosis-based society. Let’s take a look at these. Of course, how Copiosis will look in the future is dependent on those who become part of what we are doing. As more people get involved, they bring with them new insights and ideas that shape the future of Copiosis. What follows is how I believe Copiosis resolves the abortion fight given our current understanding of how Copiosis works. I’ll start laying out the issue arguments as I understand them, so you can understand my assumptions. Those who believe the procedure should be available essentially believe it is a woman’s right to choose what she does with her body. This procedure not only is a life-saving procedure, it also allows a woman to act in her best interest. This position presumes a woman knows better than anyone else the best decision for her and her body. People who believe abortion procedures should be available support beliefs of the opposition. They say, “It is okay for someone to believe abortion is wrong. Those people are free to practice their beliefs free of interference, so long as that practice doesn’t impinge on the free will of another. Those who believe the procedure should be unavailable or restricted by law feel strongly that the unborn human’s life is what is at stake. These people believe abortion is murder. This belief often originates predominantly from religious belief. Even so, people who believe this way have made scientific arguments to support their beliefs. These people may support those who wish to receive this procedure, but only in limited circumstances and only after being educated on alternatives to the procedure. Let’s take a look now at how this contentious issue is resolved in a Copiosis society. In Copiosis net benefit reward (NBR) is earned when a person acts in a way that makes another person or the planet better off. The negative results of a given human action are subtracted from the positive results of that action resulting in the “net benefit”. If the net benefit is greater than zero, the actor receives a quantity of NBR. How much is determined by the Net Benefit Formula. This formula requires eight inputs we believe account for all the factors needed to reward an individual. These inputs are represented by variables in the formula. You can examine the variables in the table to the right. As you can see, the variables themselves don’t include personal value/moral judgments that are based on religious belief for the most part. However, some of them can, should and will be influenced by such judgements/beliefs. We have a process by which such influence is included. I touch on that process below and write about it in more detail in an upcoming post. 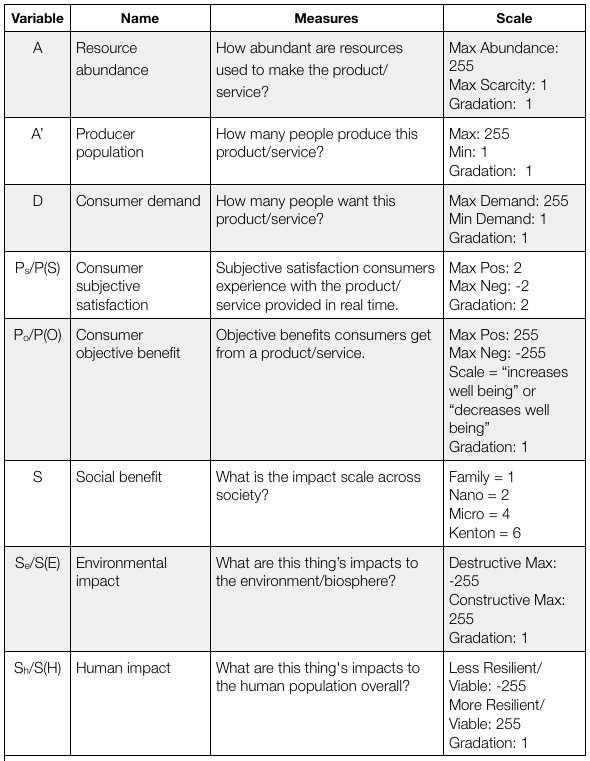 Examining the table, you can see most of these inputs are based on rational analysis of the act, resources used, and results among other elements. While allowance is made for differences in individual Ideological/belief systems, they can not significantly sway the calculation. Copiosis is a system based on human freedom. That means people are free to do whatever they want, but they have to live with the consequences of exercising that freedom. In today’s society, morals, values, ideologies, and beliefs can become radicalized through politics. Radicalization of these personal perspectives through politics creates interesting dynamics. Politics almost always attracts money, or rather, money always follows politics. What’s more, most everyone in society must earn a living—generate a money stream—to meet their debts, obligations, and needs. Politics and money create wonderful ways to earn a living for many people, not just politicians. Radicalization of personal perspectives turns such perspectives into ideological terrorism when combined with money and politics. Just as with the specter of physical terrorism, it is easy to fan the flames of one’s ire and urgency when one’s ideologies are perceived to be under threat. In many ways, it’s no different than when people’s emotions (fear, helplessness, vengeance) are stirred with the specter of ISIS, the Black Panthers, or any other politically motivated topic du jour. When such passions and emotions are aroused, it is a relatively simple matter to convert those passions and emotions into income streams. In Copiosis such profit motives, including the harnessing of people’s emotions through the radicalization of their personal perspectives, doesn’t exist. What is the net benefit of polarizing a population along personal ideological lines? In the next post, we’ll get back to the case of abortion and how could be resolved in Copiosis. « Is it the end of the charismatic era?